How true! I am sold by the logic of forgetting about the 1K gym bill against Rs 5 samosa. Let me share more. Why would one want to eat 2 or more samosas or 3 or more ice creams? Isn't 1 good enough to taste and enjoy? Any food stuff consumed in huge quantities is never good for human body. wow creative idea by CCD that is :) thanks for sharing !! First, congrats on your 100th post. Wish to see many more 100s. Have you heard about high-class women carry a minute weighing machine to weigh even the olives they are going to eat? Crazy!! 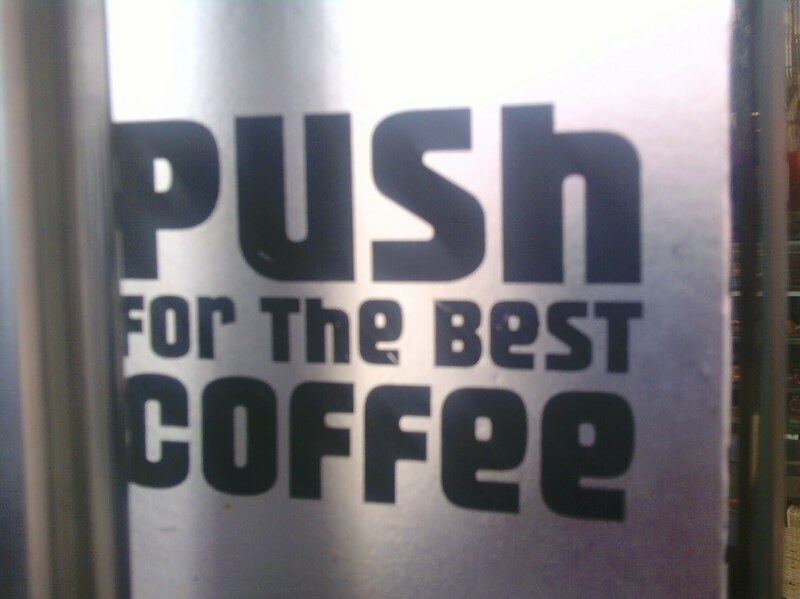 A great Push and Pull Idea! But you know what I am a big foodie and I never ever think about how much calories I am consuming! Oh! Now I want to eat pastries. By the way, I'm not calories conscious. No wonder I'm not super thin. I am not as lucky as you are with your high BMR so i do count my calories (only count haan)and i also hate wasting food...so i never throw all that cheese laden pizza left overs,ice creams,peanut butter jelly sandwiches ,chocolates my kids leave...maan ka kartvaya ! !Now it has been ages..samosa nahin khaya..100th post,mauka bhi hai,dastur bhi hai to...i want my samosaaaa !!! Neha, talking about calories,I have a lot to shed.You reminded me of these when I am at it for the last one week. I trust I dont yield to anyhing fried or sweet. Nice one! My best wishes on the century--IPL season. CCD , it seems has a great AD agency and a great marketing team. Personally, I am of the opinion that one must eat/drink every thing but in moderation. Dont give up any food--God has created it for us.And also ,mus t take a walk--I do 1 hr everyday in the morning. And yes, it was on Saturday, the MD of CCD was on ZEE Business explaining how he has succeeded in making this venture a success. Keep eating- it is good for our health. so true...u know what neha, the things which u write in ur blog are so common and very much around us , but would not have given much thought about it, and there u score coming up with those topics in a real good readable style...thanks. Very nice post! Thanks for sharing and you are really blessed to have a great metabolism..
Congratulations on your 100th post, Neha!! A cool milestone achievement! Oh this is interesting ! push and pull to lose the calories ! hmm ! Forget the Rs 1000 on gym while having a Rs 5 Samosa... damm thats so true!! I like the idea of attracting cusomers at CCD, but ya as u said... its not that simple... it was an awesome read and congrats on ur 100th post! Ah calories..the bane of my life...as far back as I can remember I was worried about my weight. Lucky youwho has a good metabolism...me I just look at a samosa and add calories. One of my favourite jokes is about candies: ten minutes on the lips, ten years on the hips!! 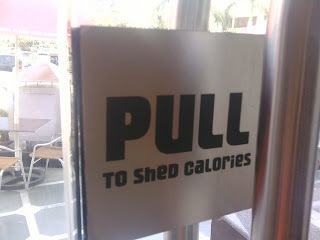 "Pull to shed calories".....do know whats that is all about?? All we need is moderation! Interesting concept by CCD. I hear this is the 100th... Congrats :). i am i guess those 'blessed' few who eat like a pig work like a sloth yet don't put on weight! I mean i am not even normal I am thin! nice concept by CCD tho! @ Insignia, thank you..and weighing olives? ewww, that's absurd and crazy..
Hi.. you made some good points about people eating junk food..but most people forget one basic fact. You need to exercise whether or not you are fat/ thin. Exercising is about keeping your muscles and joints healthy which does not happen just by staying thin! Lot of health problems arise because of this! Congratulations for hitting a maiden century. Hope you will go not out for your second century. I do not have a calorie problem. Even i'm fortunate in that case..have a good metabolism..
luv those extra calories..yummm...my heart goes ooh-la-la on seeing anything which gives the impression of being yum...no matter what it turns out to be!! On a serious note, obesity leads to many problems. Besides the unhealthy food, we have become so used to all kinds of comforts like cars, taxis, remote control, maid servant cleaning the house and machines doing all physical work. We hardly walk. If we just stop using remote control of the TV and walk to the TV to change channel or change volume, it might do some good. Walking to work is anohter useful way to save planet and reduce obesity assuming your office is at walkign distance. Tough to count calories when busy...avoid sweets and fried stuff...thats my only rule! oye this is your 100TH post!!! all my resolutions about calorie control just fly out of the window at the sight of any sweet. so what is few calories here and there. Hey i did not remove yours. Maybe yahoo is acting crazy. My policy is not to remove any comments. Ah a post on calories! Maybe I should get one of these for my blog! LOL. Nice post on how people forget their weight, fat etc etc when they are hungry and craving for food. Offcourse, my situation is different as I am always full, so no craving, hence no 'extra' calories' LOL. Anyhoo, I read this is the 100th Post! AWESOMENESS! I liketh :D. Keep going. Oh haan, Treat dena bhulna mat :D.
I am one of those who were not 'blessed' except during my college days. I look back at those days of trying to put on weight with lust and longing.